We've been traveling every weekend for the last month--so many new places, so many hours on the road, so many I Must Be Off! posts to write! I won't lie to you. I'm behind. 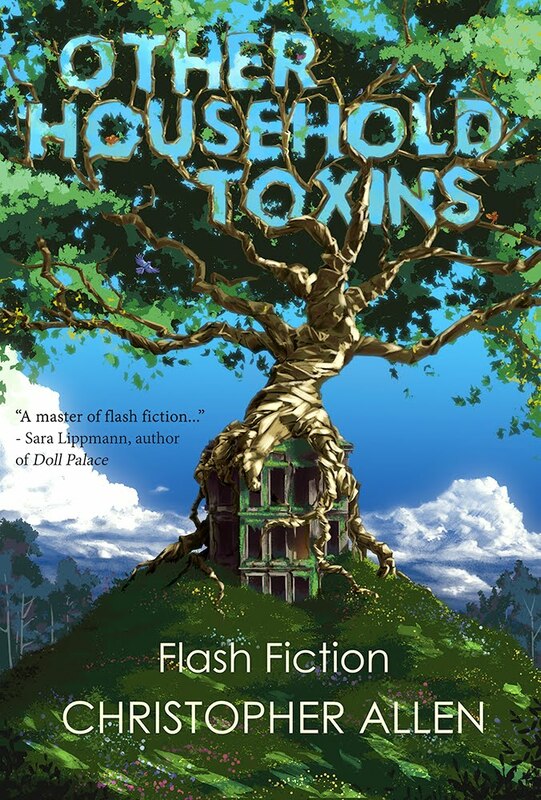 For the last few weeks, I've been waist-deep in organizing--together with editors Michelle Elvy and Linda Simoni-Wastila--Flash Mob 2013 in celebration of International Flash Fiction Day (June 22). Now that it's over--or at least finished for the world to enjoy--I can turn back to my travels and remember the days in the sun. It has been raining here in Munich for what seems like a decade. About a month ago, Frank the Sushi Knife Sharpener and I took a weekend trip to Porto, Portugal. We'd been meaning to do this for years. We'd been to the Algarve and Lisbon, but Porto was still sitting there weighting down our travel list. "We are flying to Porto at the weekend," Frank the Sushi Knife Sharpener says to me one rainy day in late May. "Well, finally," I say. "And obrigado." "We are flying to Porto from Nuremberg," he says. "Oh. Hmmm. You do know we live in Munich, right?" "Of course I know this." Frank's sense of humor is legendary. "We are going to buy a Bayern ticket and take the train to Nuremberg at six o'clock in the morning on Friday, which means we will have to get up at 4:30." "Sounds like a plan, Stan." "My name is Frank the Sushi Knife Sharpener. You know this." The flight to Porto from Munich would have cost several hundred euros, but the flight from Nuremberg cost only a hundred. The Bayern ticket for two people was only 40 round trip. Our hotel--the Tryp Hotel chain--was a great deal at 45 euros a night. Check out my TripAdvisor Review. If you coordinate--or if you have a Frank the Sushi Knife Sharpener of your own who's more the coordinator to your incredible adorableness (as is our situation), you can really save some money. 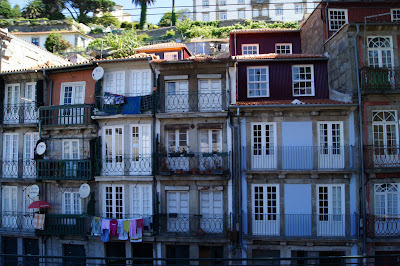 The old town of Porto is a World Heritage site. I wonder what Porto did with the money they got. They certainly didn't put any of into restoring the houses along the river. Yes, there are parts of the old town that are getting a make-over with European Union money, but many of the buildings are literally crumbling. I've heard the reason for this is paralyzing red tape. Another reason might be that some people think crumbling buildings are rustic and somehow more culturally attractive than newly scrubbed and painted ones. 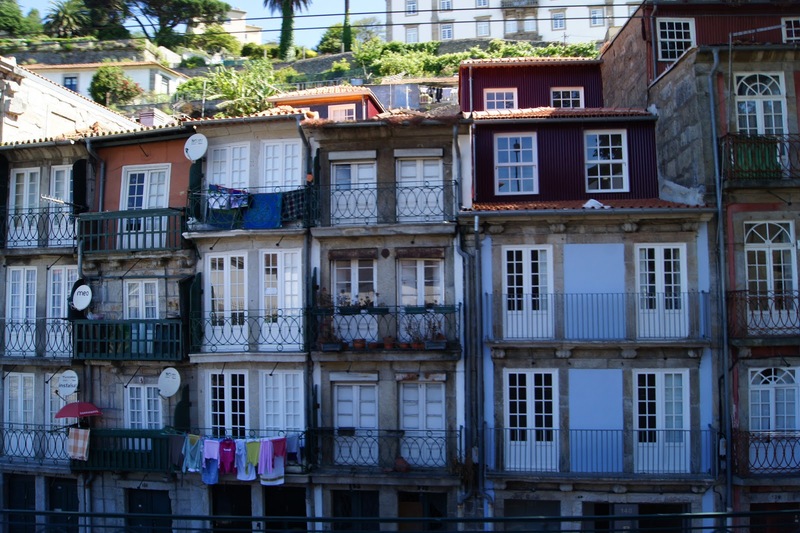 Porto is the home of port wine. 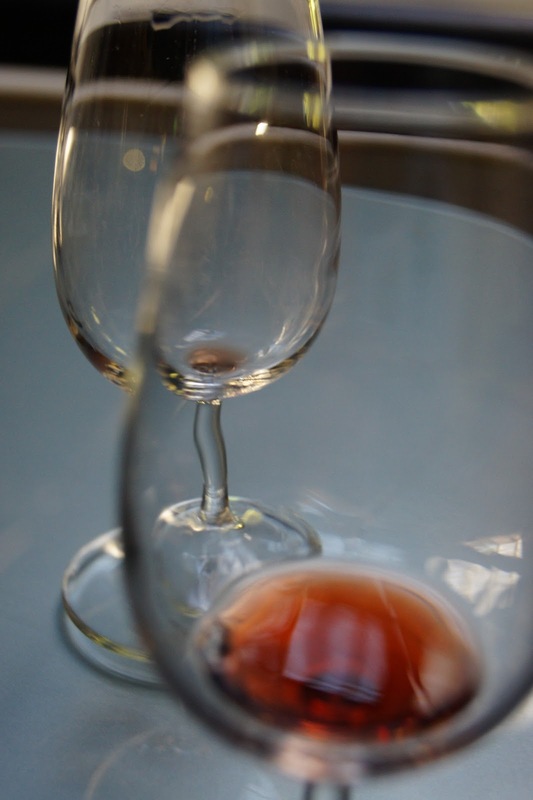 Port wine and I have shared some fairly awful mornings, so I wasn't looking forward to drinking my old friend--that sounds like Hannibal Lecter--for dinner. As it it turned out, we had only a (free) taste of tawny port that was included in our Hop-on/Hop-ff bus tour of the city. Yes, we do this tour every time we visit a new city. It's really the best way to get an overview of the town. After you know a bit more about the city, you can explore it much more efficiently on foot. The first evening in Porto, we had dinner at a restaurant that had outdoor seating in an alley--a busy alley with lots of kids and a fat old woman shouting at everyone who passed by. And everyone who passed by was smoking. Clouds of smoke. Even the kids. OK, not the kids. The food was great. The service was not great, but at least the waiter apologized for making us wait forever to order. In general, everyone in this city was so nice. Really. 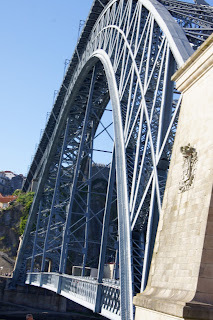 One symbol of Porto is the Luis I bridge that connects the old town of Porto with Vila Nova de Gaia. 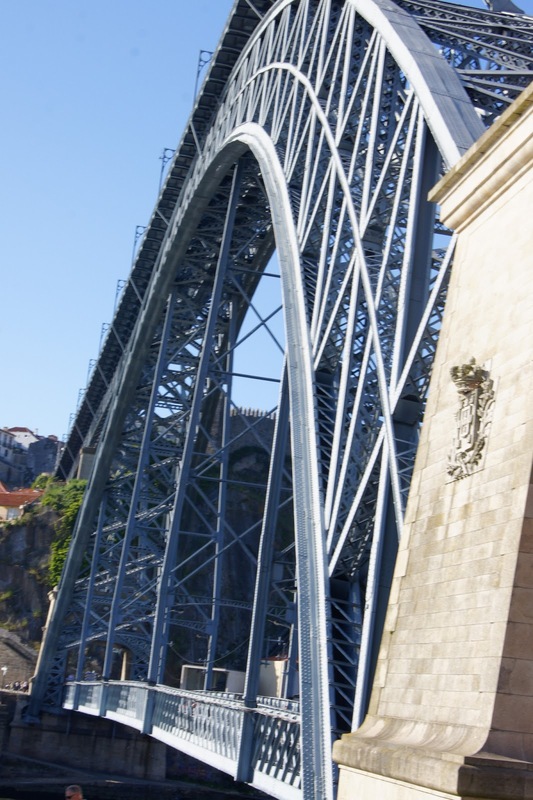 Spanning the river Douro, the bridge was opened on October 31, 1886 and was designed by Téophile Seyrig, a colleague of Gustave Eiffel, the designer of the Eiffel Tower in Paris. You should walk across the bridge from the old town to the other bank, and then you should lie down on the grass and peoplewatch. This you should definitely do. The little bars and restaurants along the road on this side of the river are informal and friendly. 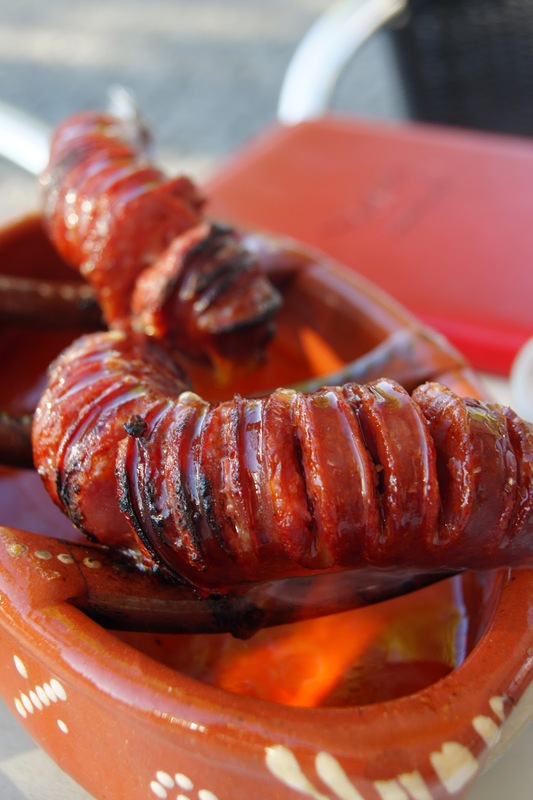 One traditional dish you should try is the chorizo sausage that's grilled at your table. You are the cook here, so it helps if you have a steady hand. We bought one of the ceramic forms (exactly like the one in the picture over there) because Frank the Sushi Knife Sharpener thinks it will be fun to use when we barbecue in the garden (we've never barbecued in the garden). 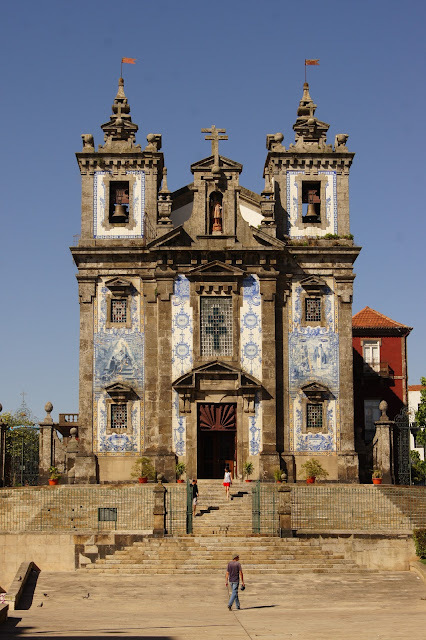 In the next installment of City Hopping, I'm going to take you to the Botanic Garden in Porto, which was actually great fun.And we're going to go through the locks on the Douro river with 200 kids. Really really great fun. 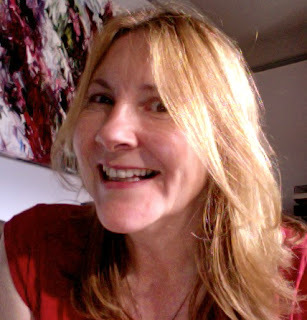 On July 4, I'm interviewing expat author Alex Pruteanu. Be sture to stop by I Must Be Off! for this. It's a serious discussion of the state of things in America. Maybe you'll want to add your thoughts? To continue with I Must Be Off! A-Z, go to Q is for Queenstown. Christopher Allen is the author of Conversations with S. Teri O'Type (a Satire), an episodic adult cartoon about a man struggling with expectations. Allen's fiction and non-fiction have appeared or are forthcoming in SmokeLong Quarterly's Best of the First Ten Years anthology, Prime Number Magazine and BootsAll Travel. Nice city sight and delicious foods. Love them. That chorizo looks veeery good! Flash Mob was grand; thanks for taking time to work with the others to organize that. Sweet. I had such a great time. It was a lot of work, but I will do it again and again. Excellent stories. Yours was one of my faves. Glad to have had it at Metazen.